Zimbabwe National Liberation War Veterans Association Secretary-General Victor Matemadanda (centre) flanked by Spokesperson Douglas Mahiya (left), Vice Chairman Headman Moyo (right) and other provincial executive members. THE MDC youth assembly Wednesday vowed to resist alleged attempts by war veterans secretary general Victor Matemadanda to turn the country into "an old people's home" through sponsoring a constitutional amendment aimed at revising the minimum age of any aspiring State President to 52 years. Matemandanda, who is also Defence and War Veterans deputy minister, told journalists at a press conference in Harare that all future presidential candidates should be mature enough to "fully grasp the gravity of what it means to run a country". 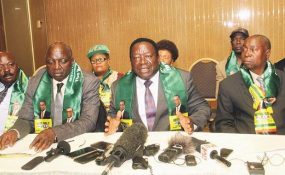 As war veterans, he said, they were pushing a motion through the party's December conference for Zanu PF to use its two thirds parliamentary majority to initiate the controversial amendment that should see the age revised upwards from the current 40 years. The Zanu PF loyalist's remarks were construed as directed as MDC leader Nelson Chamisa who has kept President Emmerson Mnangagwa's government on its toes through public demonstrations calling on the 76-year-old leader to surrender his job. MDC is adamant Mnangagwa stole his way to a slender victory in the July 30 elections at its leader's expense. At a press conference in Bulawayo on Wednesday, MDC youths came out guns blazing, insisting they were going to resist the move. "The first thing which the war veterans should know is that this country is not theirs," said Takunda Madzana, the MDC deputy secretary general for Bulawayo. "The other thing which they should also know is that the energy that they had in 1975, which we have today, and choosing not to be violent or choosing not to defend ourselves in a non-violent manner, does not mean that we cannot take that route." Madzana said party youths will not sit idle as the former freedom fighters reduced the country into an old people's home. "So they (war veterans) should be warned and they should know that we will do anything as the youths of this country and Matebeleland to make sure that we defend our country. "We cannot watch whilst some people are trying to turn this country into a people's Old Home. "The reason why we did not go to the diaspora is because we all love this country. So, if anyone thinks that he owns or he wants to turn this country into an old people's home where only old people are recognised as Zimbabweans, then we are just saying let them try and they will see how we are going to defend our country and our generation," said Madzana. Madzana said MDC youths' sentiments were also shared by fellow youths across the political divide as it concerned their future. "What Matemadanda said is a generational attack. "Even Zanu PF youths do not agree with what the war vets are saying. "As youths, we are all fighting for the retirement of leaders after attaining 65 years but sadly, they still want to block young people from actively participating in the affairs of this country," he said.